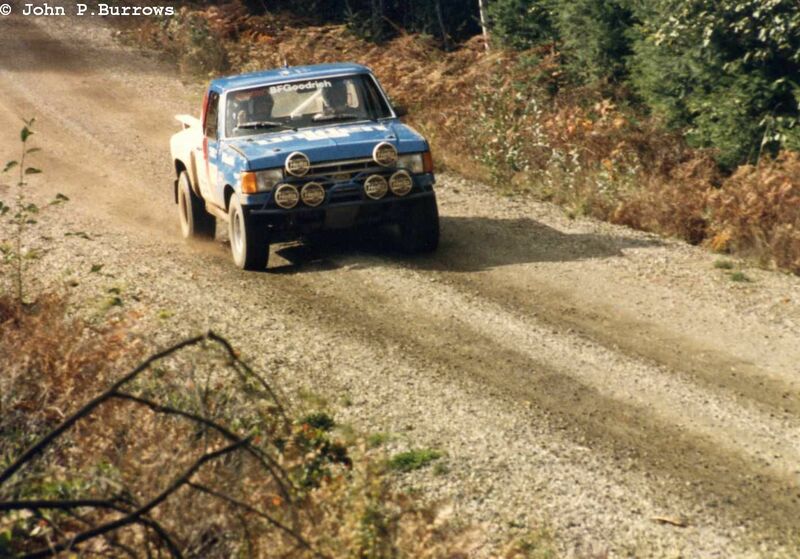 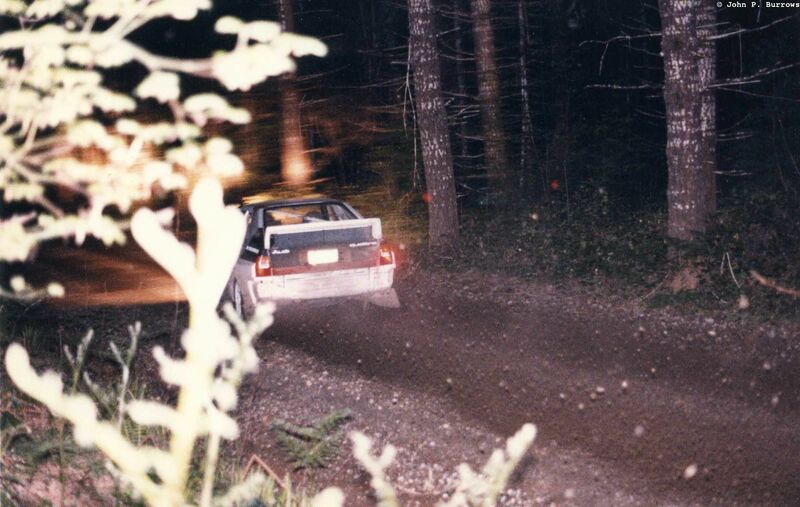 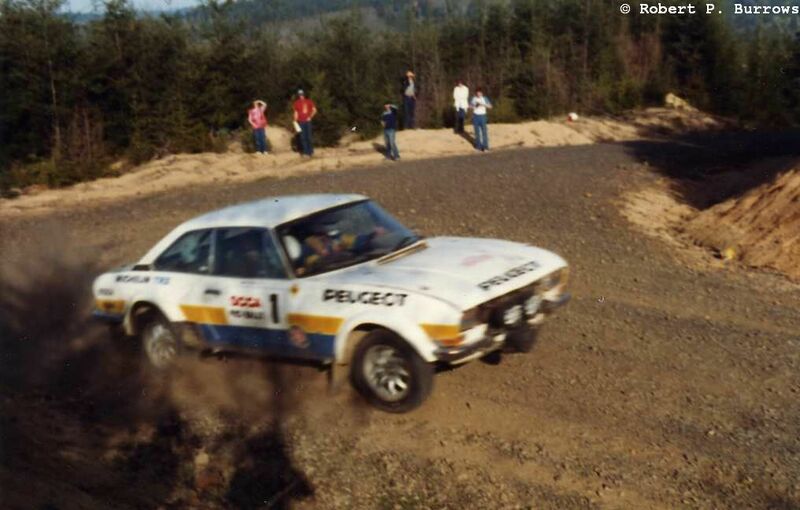 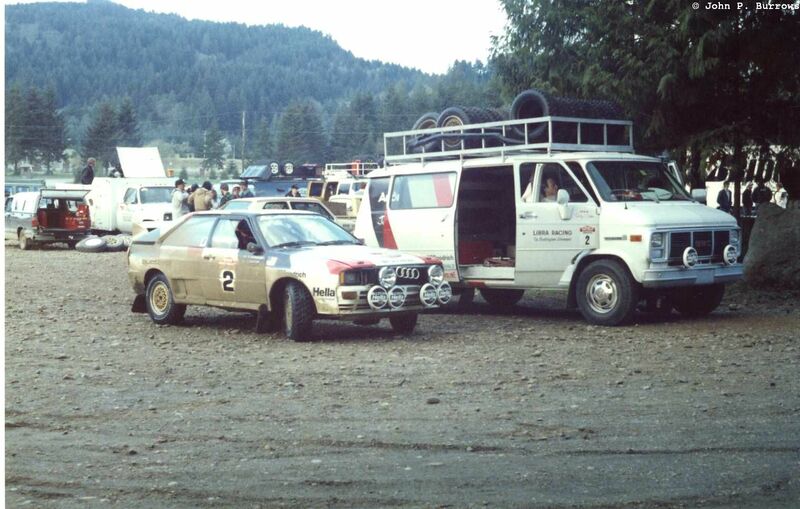 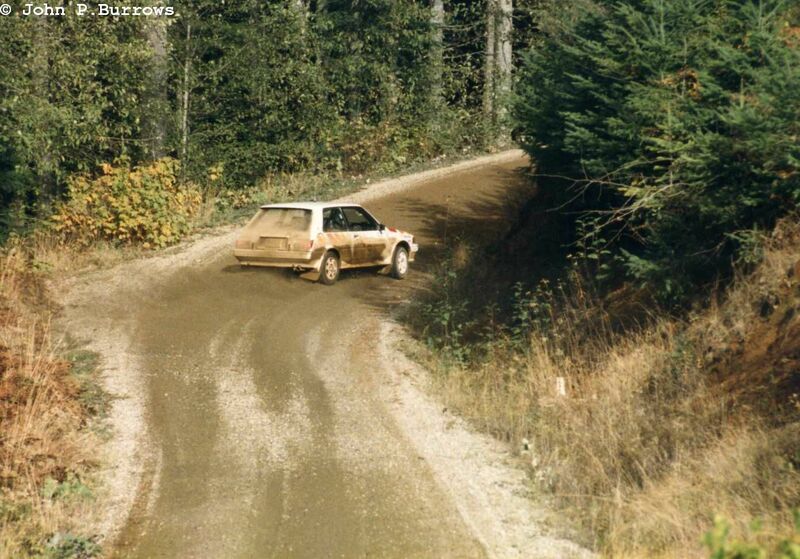 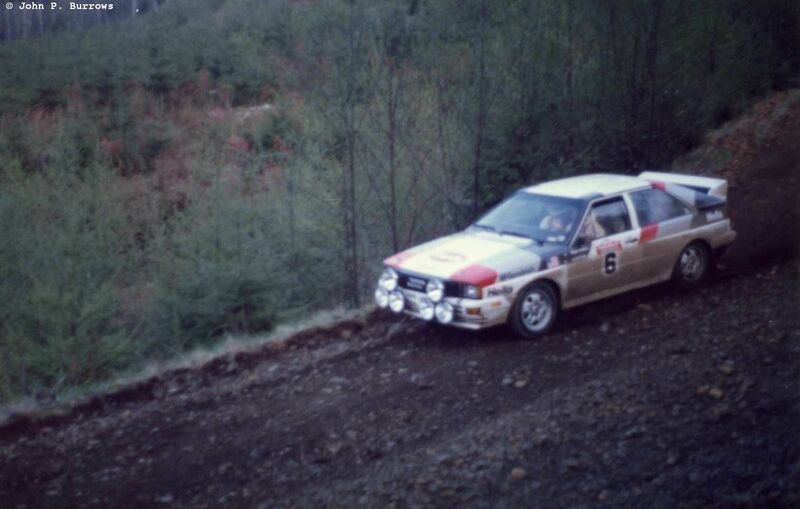 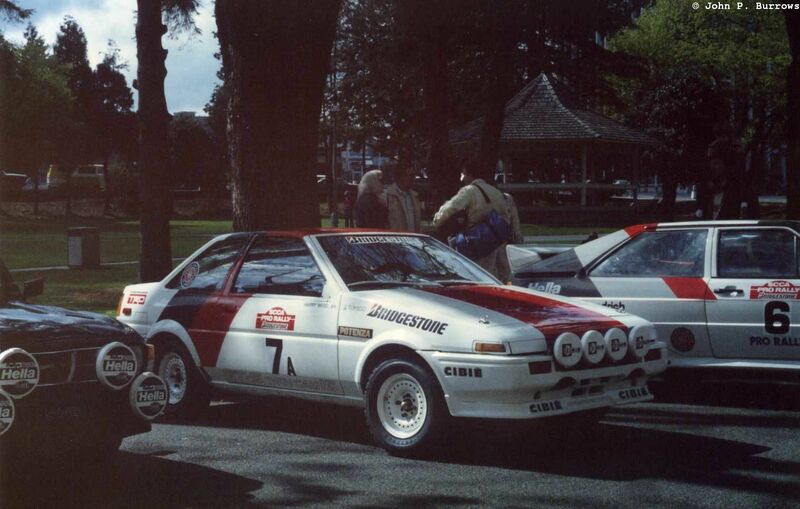 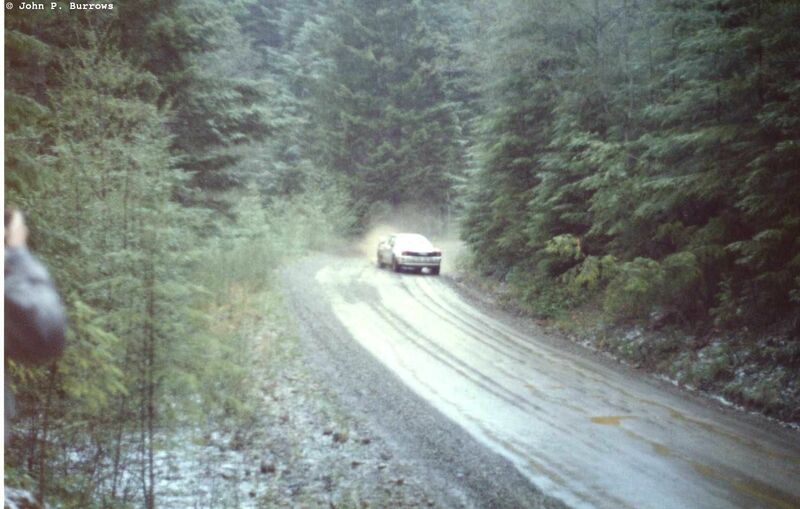 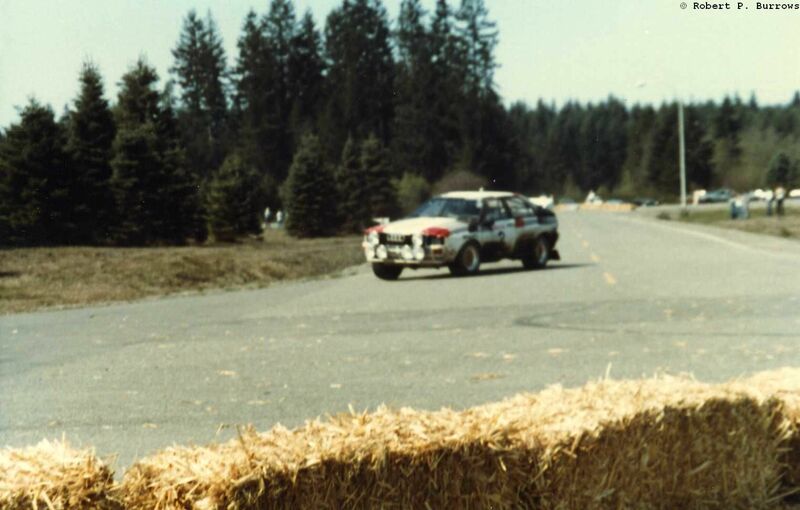 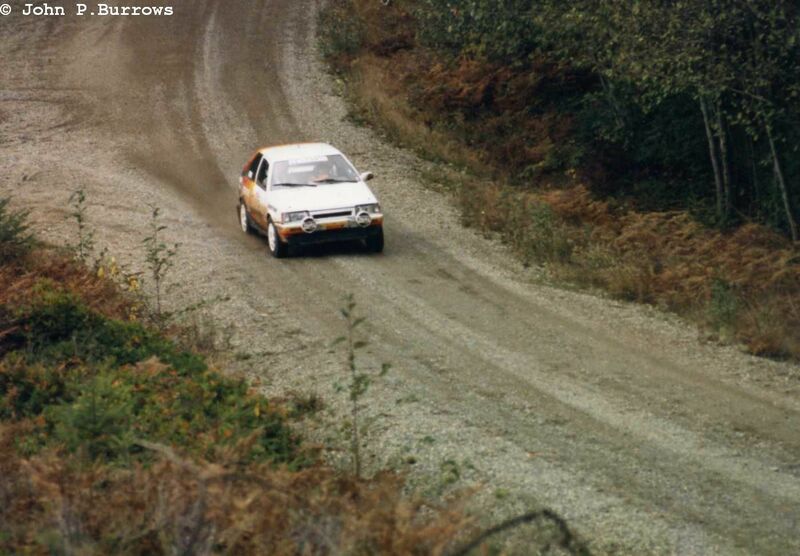 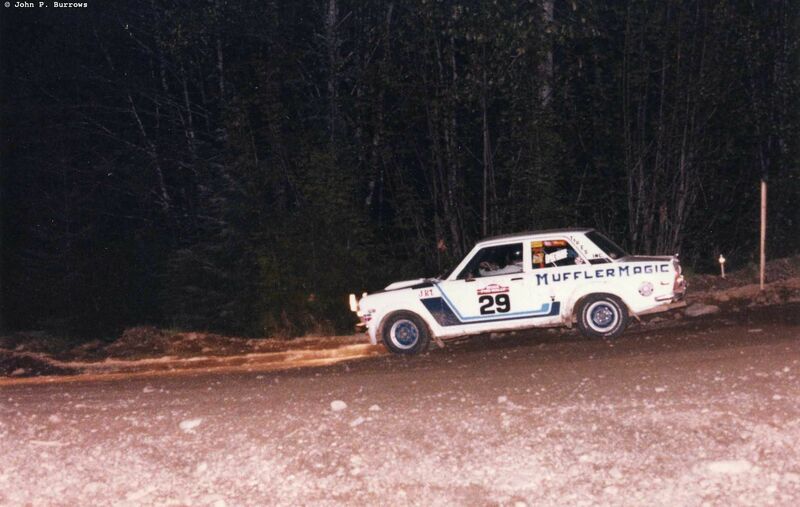 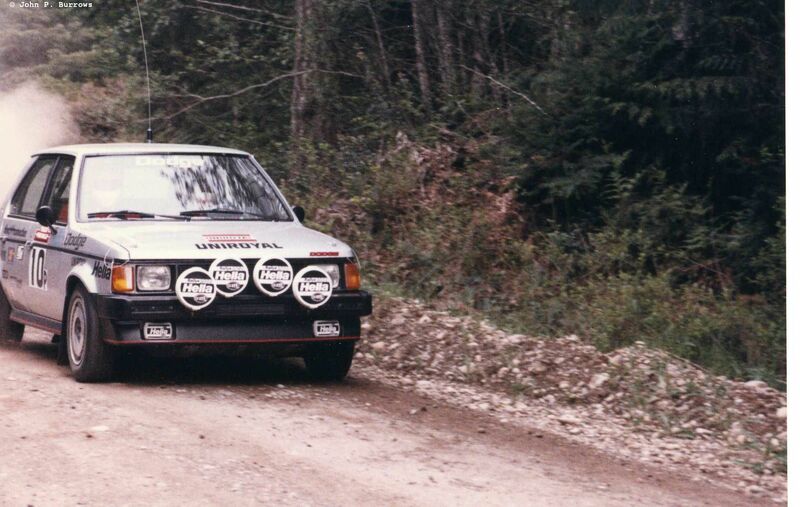 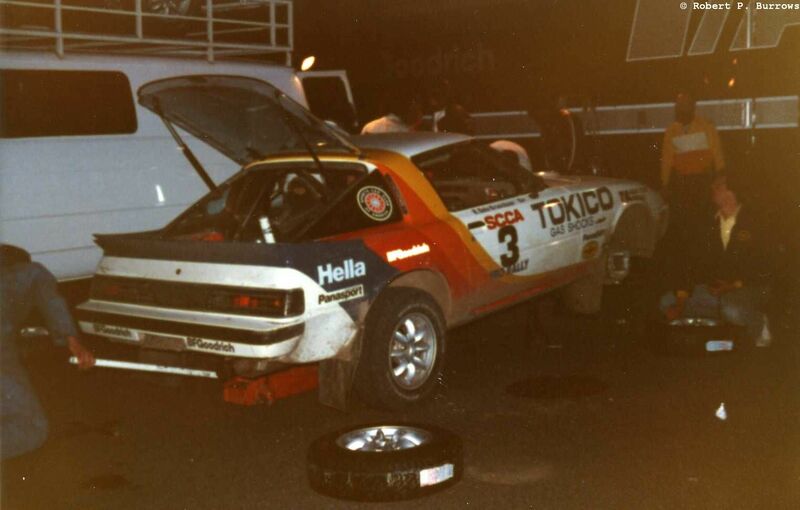 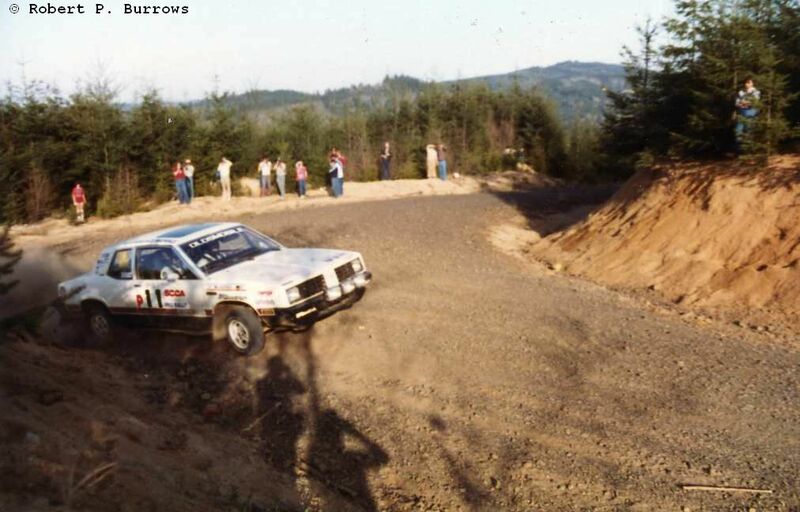 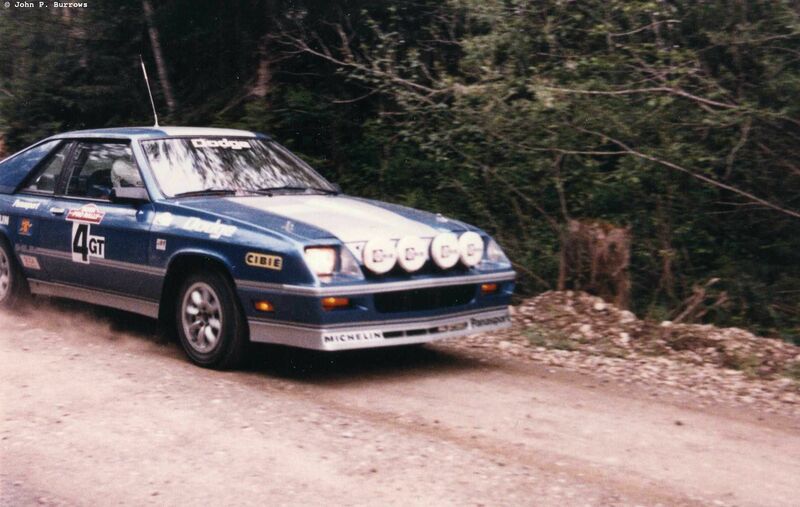 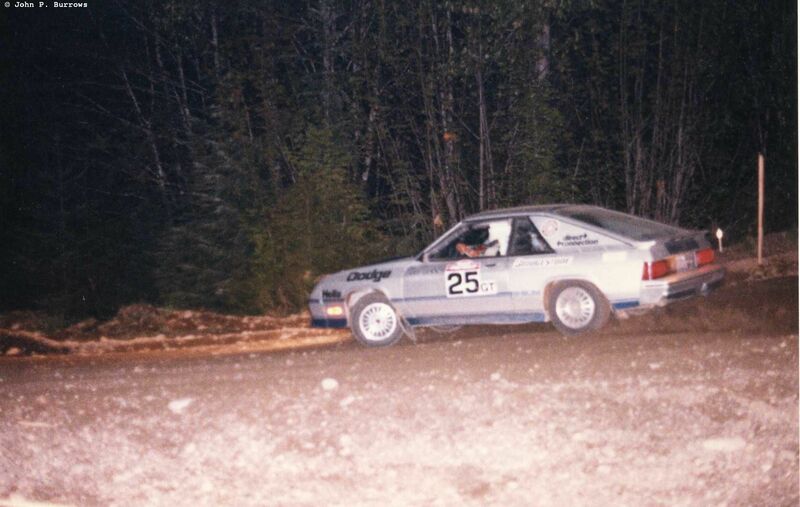 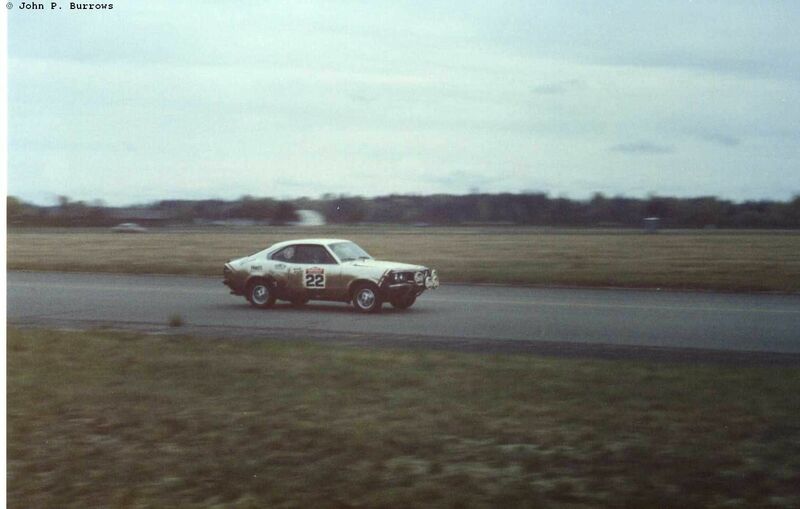 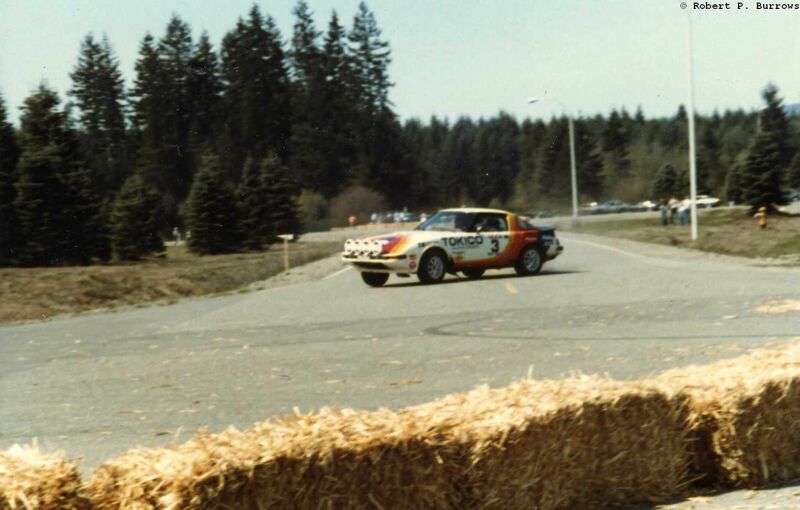 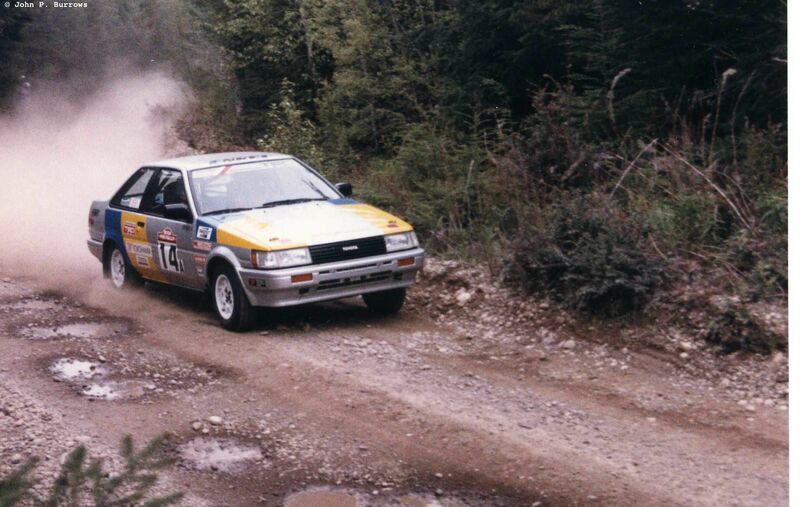 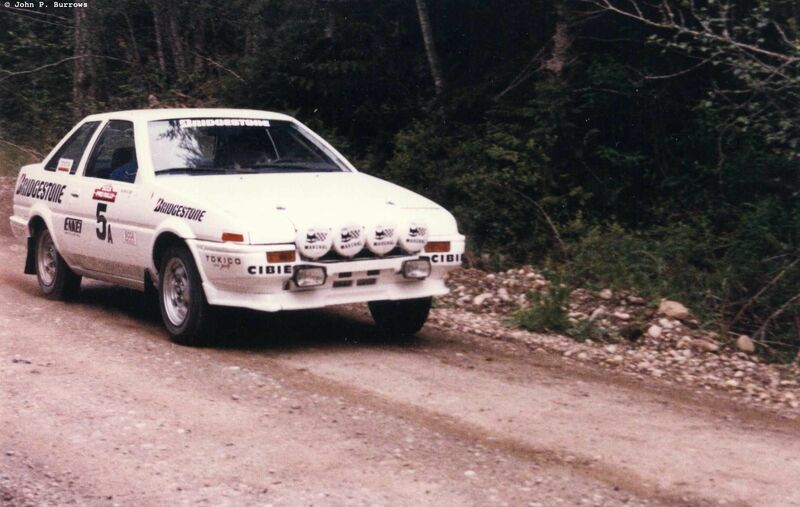 I went to my first SCCA Pro Rally in the fall of 1982, the Tour de Forest based in Tumwater, WA. 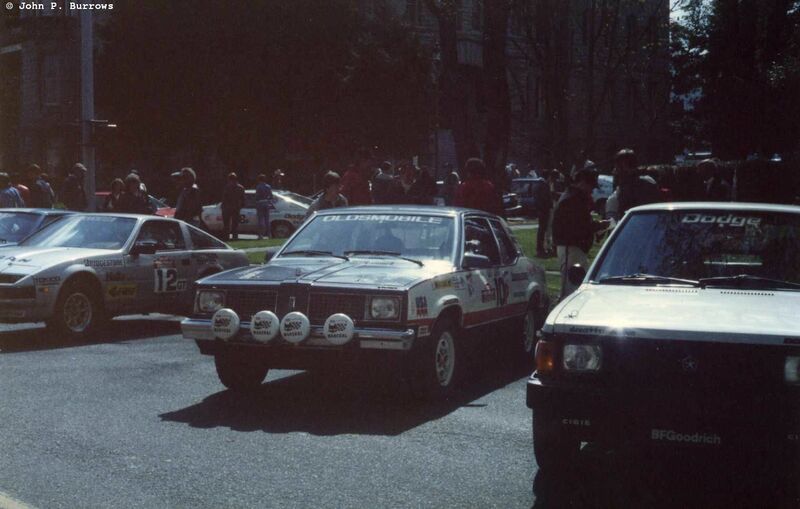 I had been reading about the Audi Quattro rally cars in Europe and specifically remember an article about SCCA Pro Rally in Road and Track, and when I noticed that a Pro Rally was being held near where I lived. 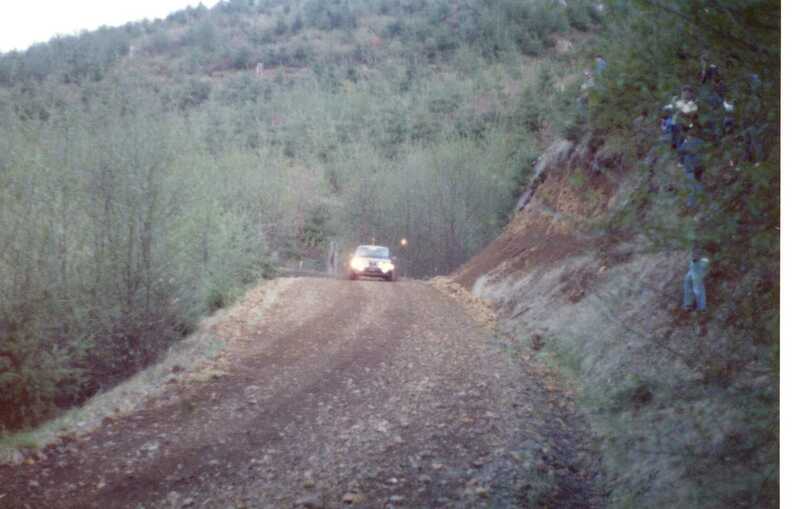 My brother and I decided to check it out. 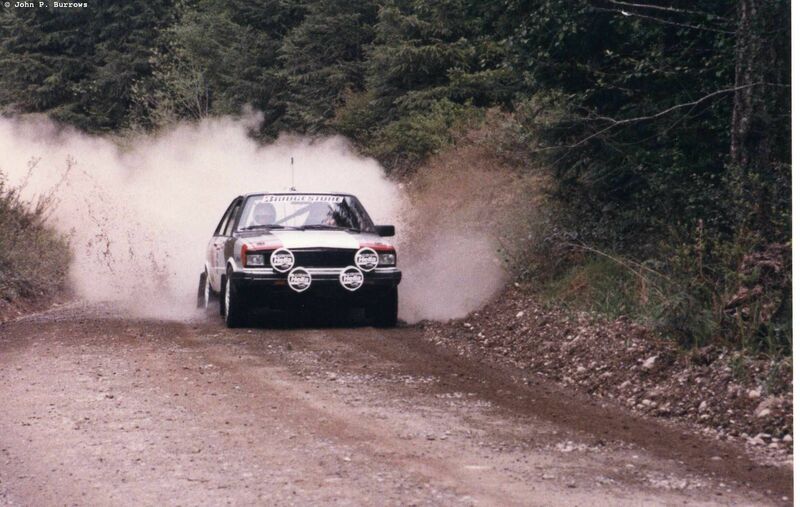 After learning not to stand on the outside of a corner after Rod Millen sprayed us with gravel, we were hooked. 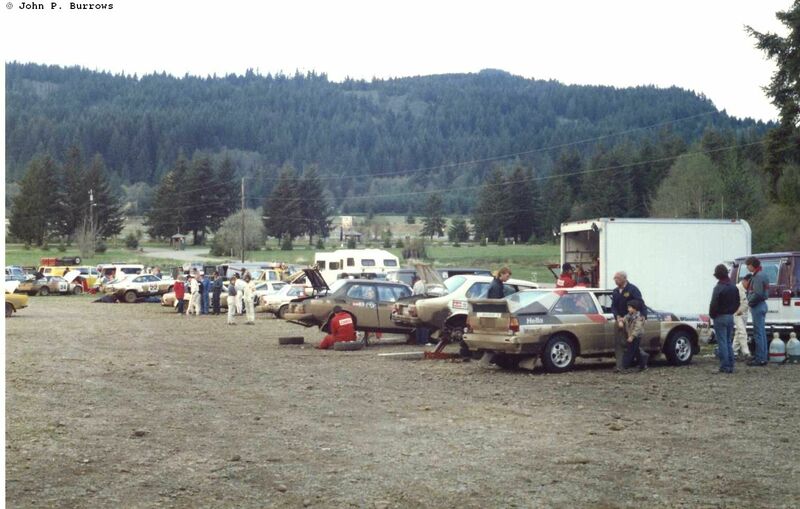 In 1983, the local Pro Rally organizers in Washington decided to become serious about getting one of their rallies included on the World Rally Championship calendar. 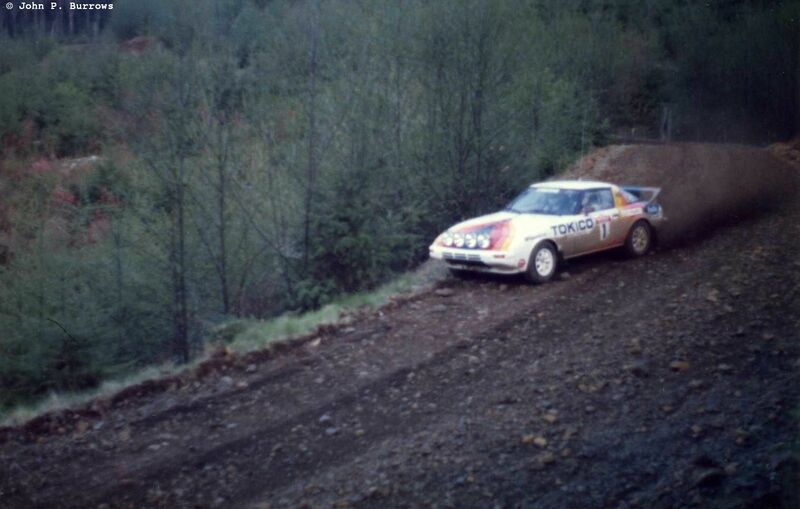 One of the first things they did was move the dates of the Norwester Rally and Olympus Rally to be consecutive weekends in April, titling it Rallyweek Northwest. 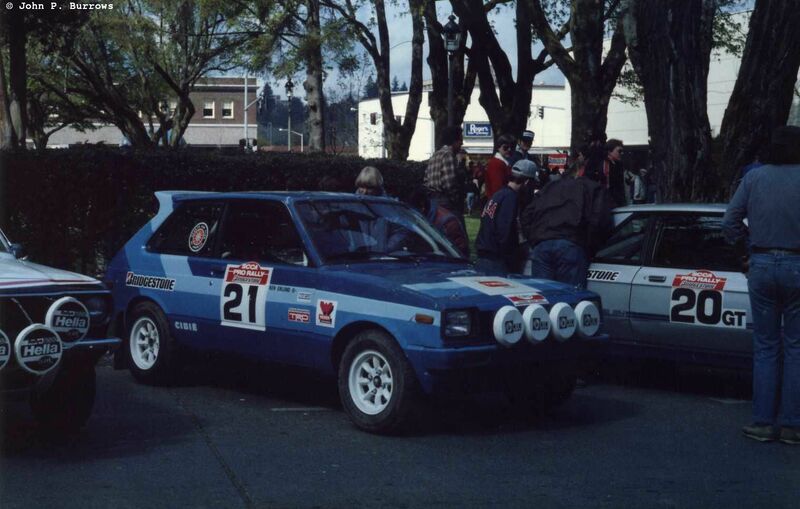 My brother and I went to both rallies in 1983. 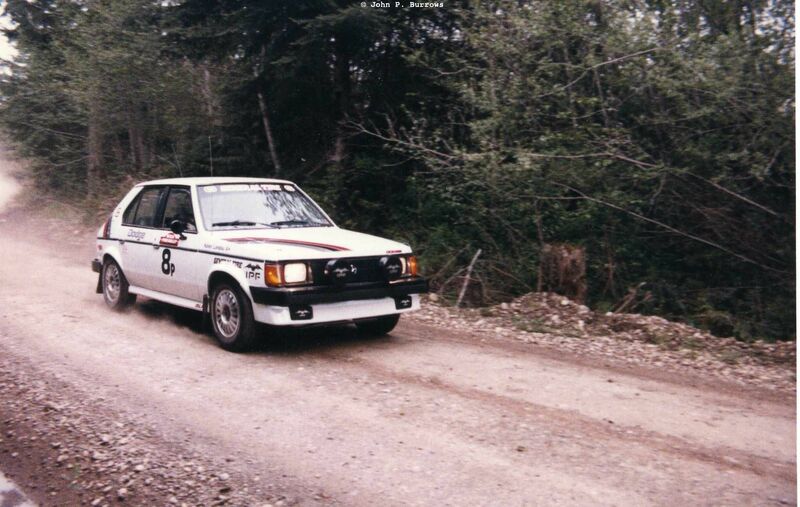 My brother took the following shots on the Olympus Rally 1983. 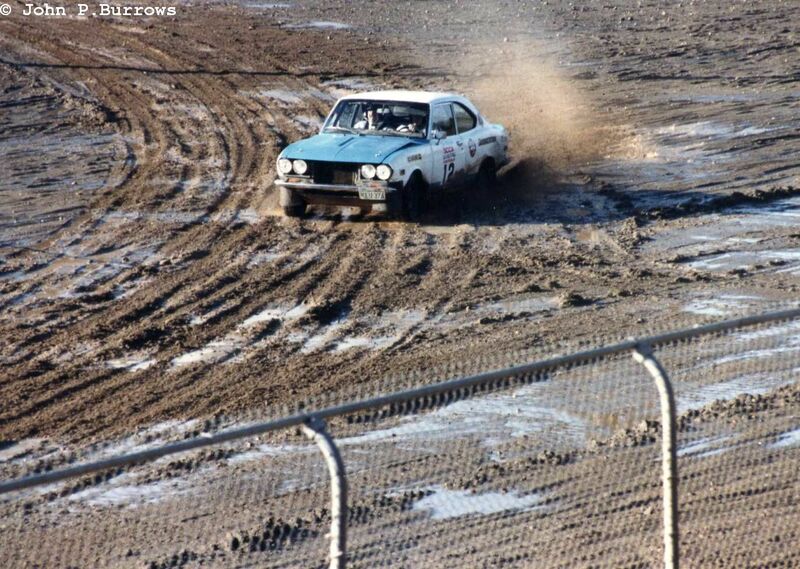 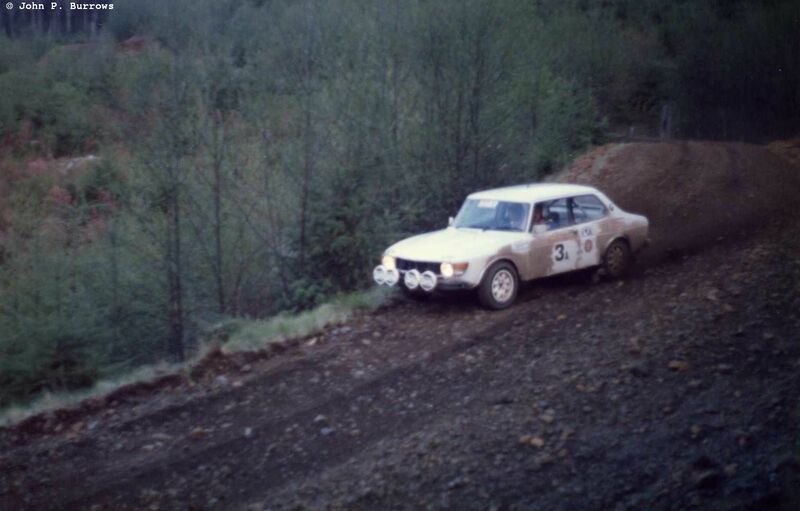 The late Jon Woodner was first through the stage in his Peugeot 504. 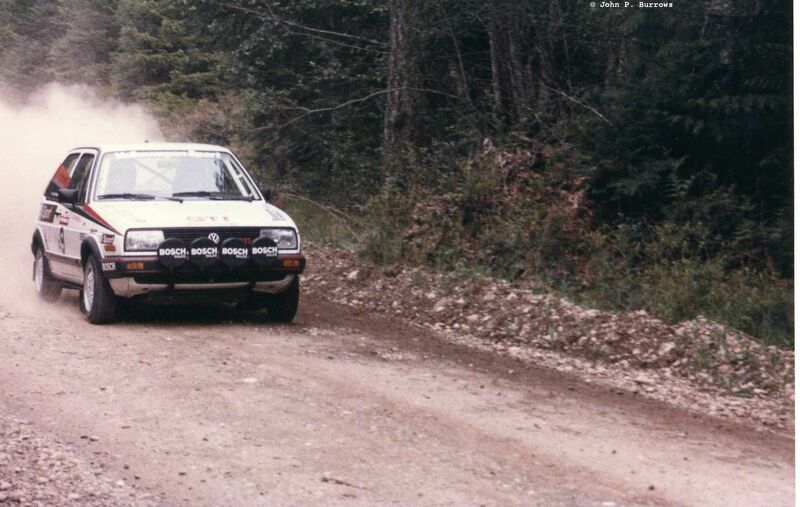 This car was an Ex-Safari rally Peugeot factory team car, that is now part of a collection in Greece. 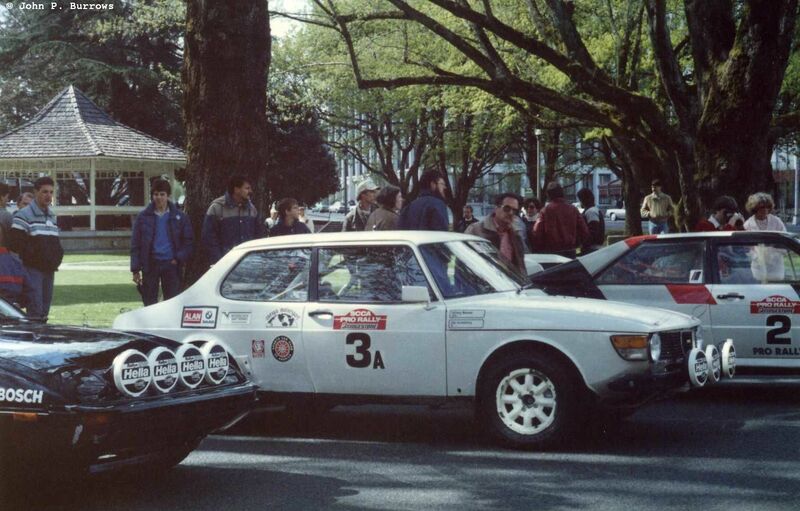 Remember when French cars were still for sale in the U.S.? 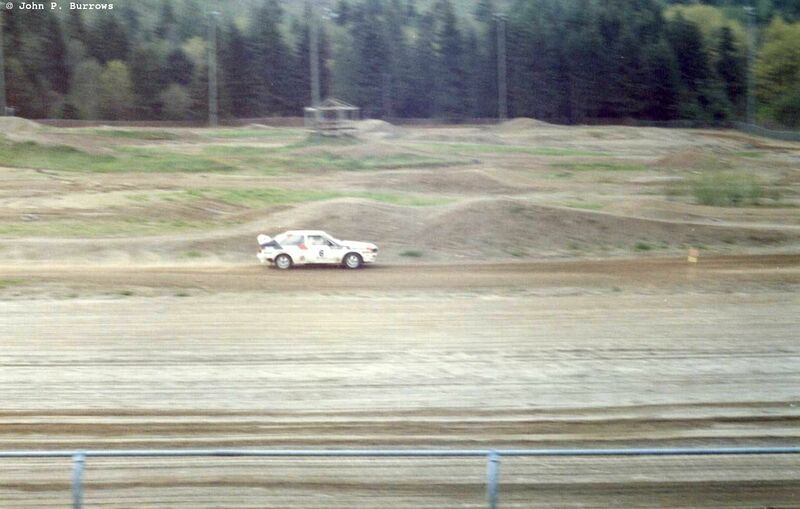 I think the stage was near Aberdeen, WA. 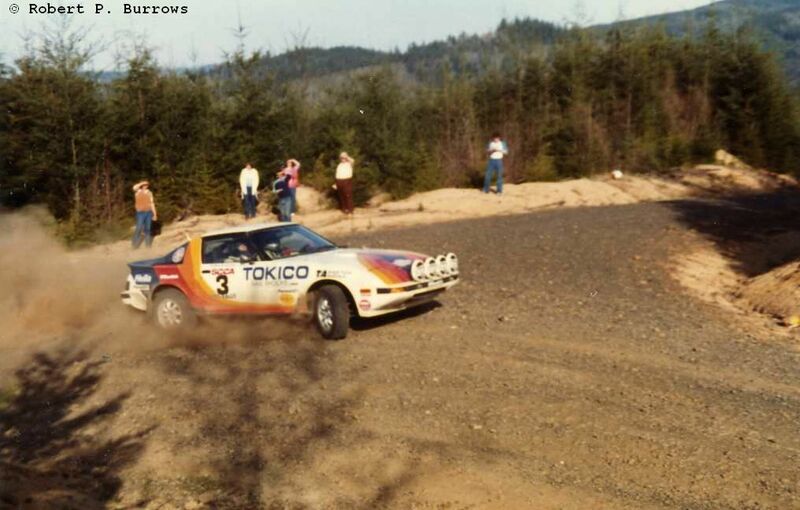 Rod Millen was through next. 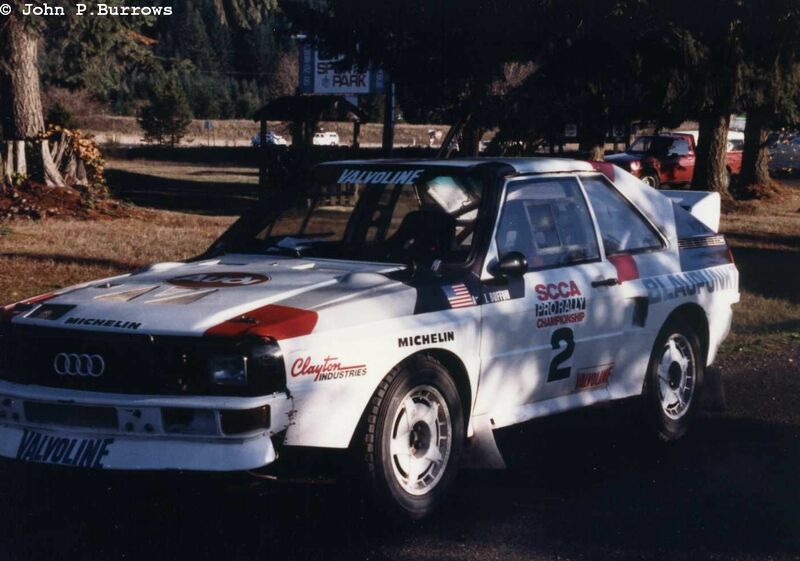 This year he was running a four wheel drive RX-7 he built in his Newport, CA shop to be able to compete with Buffum in the Quattro. 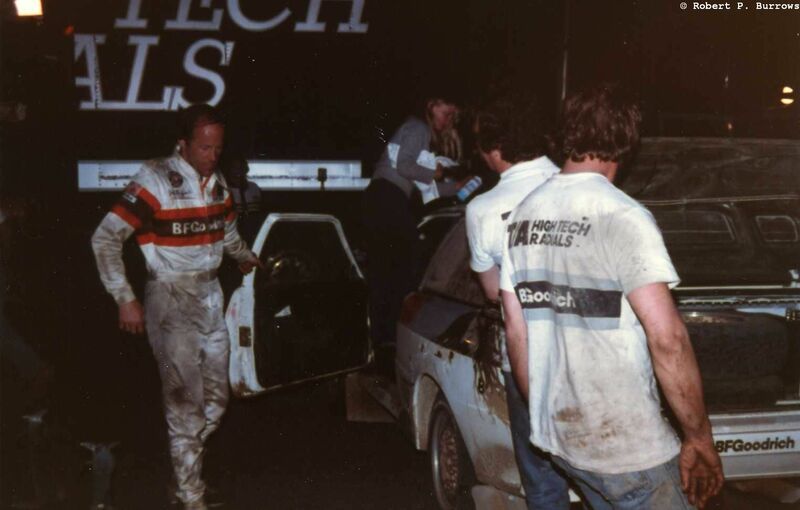 John B was next through the stage. 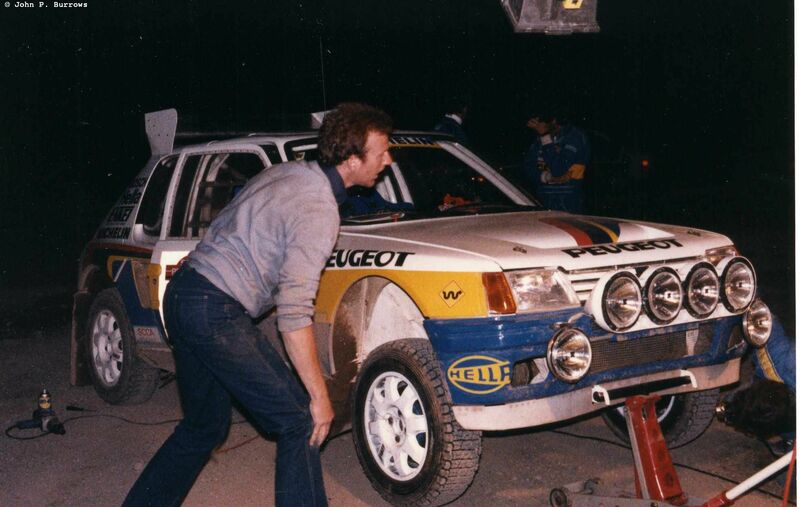 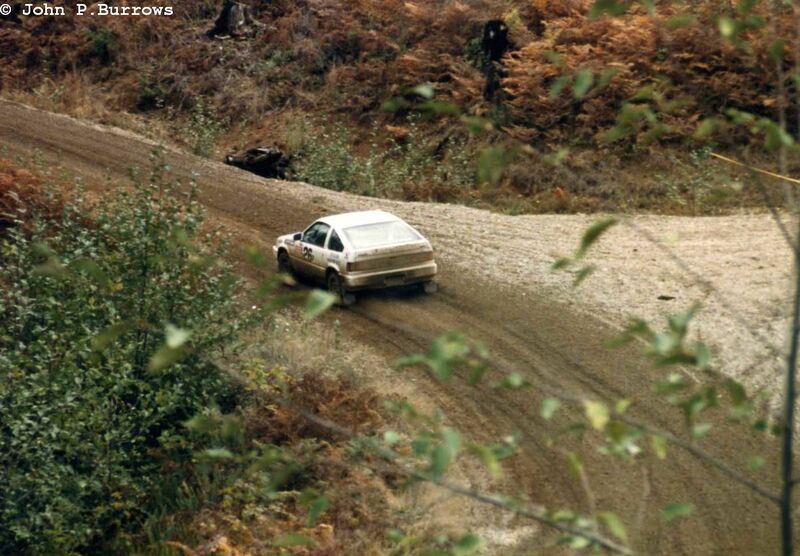 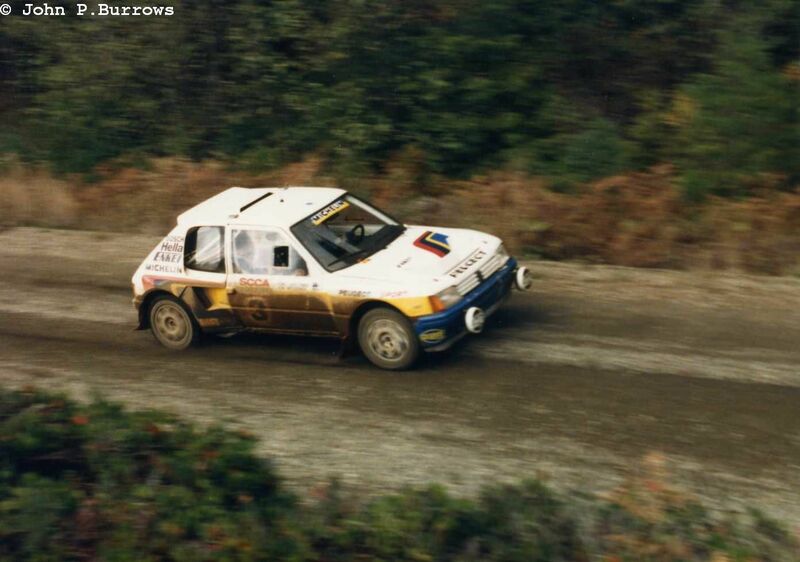 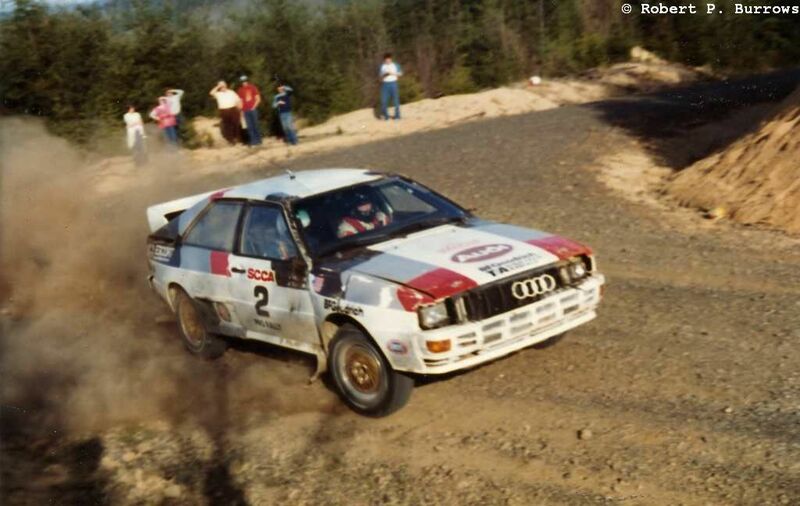 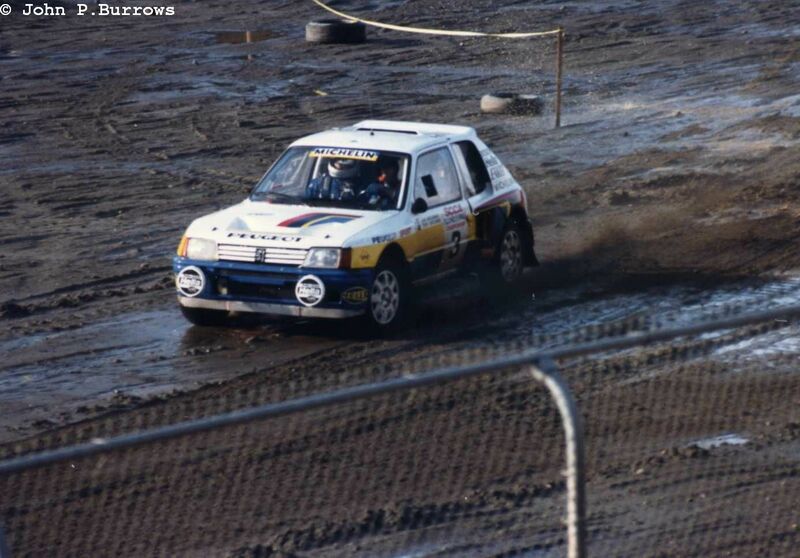 John had just switched to an A1 Quattro, from the Group 4 Quattro that he ran in 1982. 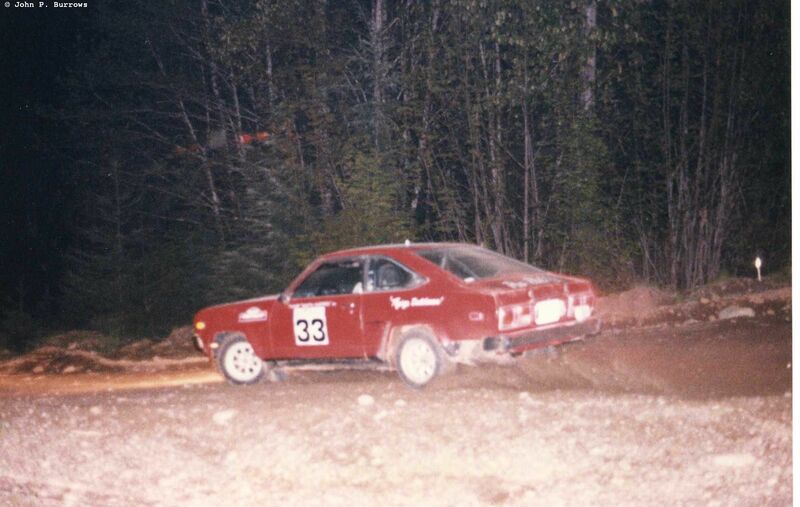 The car had just arrived from Germany, and John won the previous weekend’s Nor’wester Rally with it. 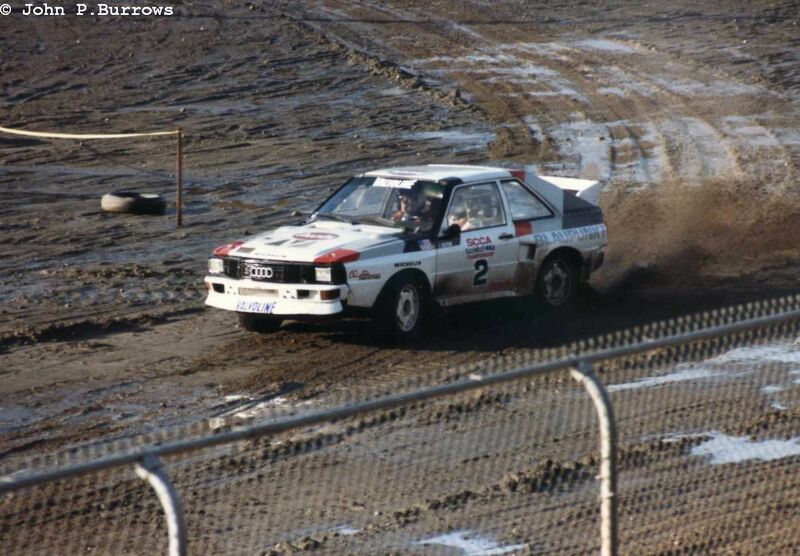 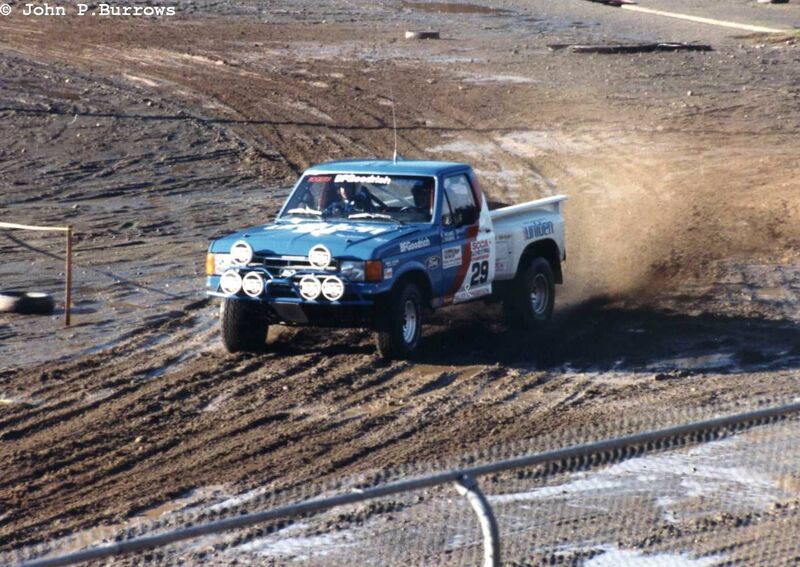 This time at Olympus, John had a U.K. co driver on board, Steve Fellows. 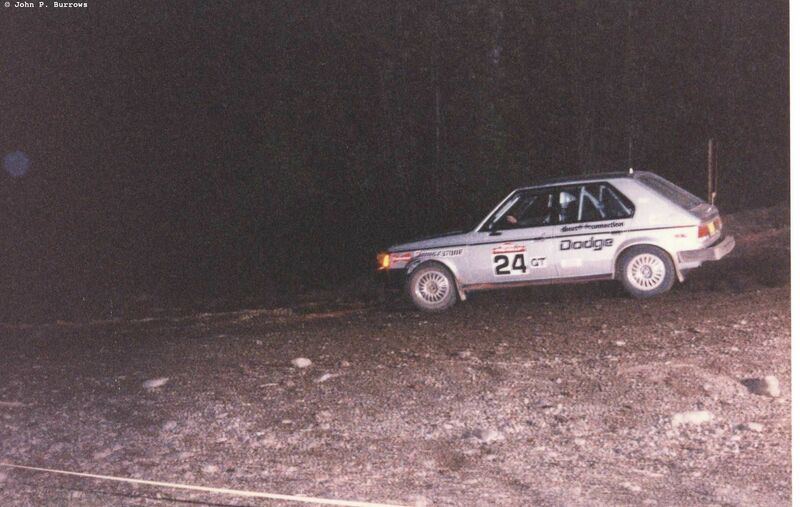 Steve was writing a book on rally navigation. 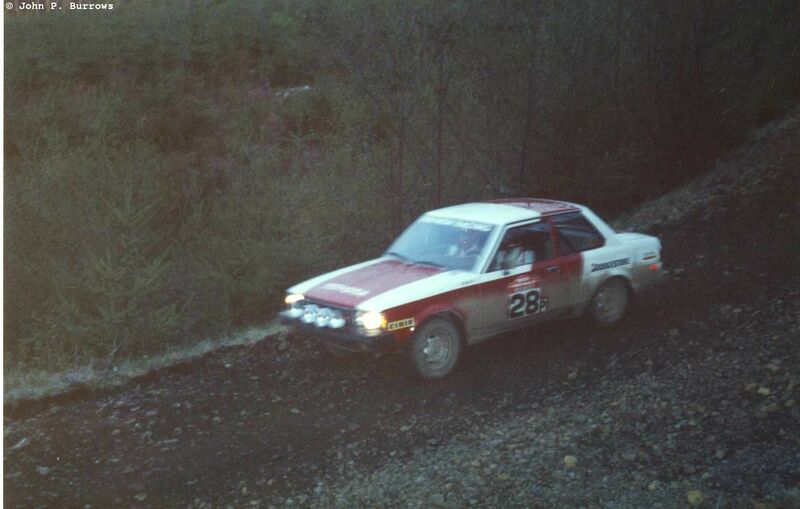 I bought it when it came out and still have it. 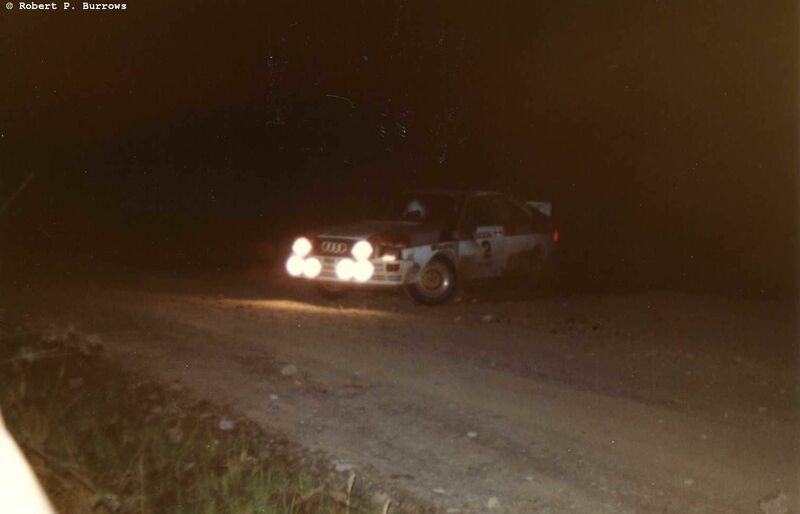 John went wide on an earlier stage, hit a hidden stump and rolled the Quattro. 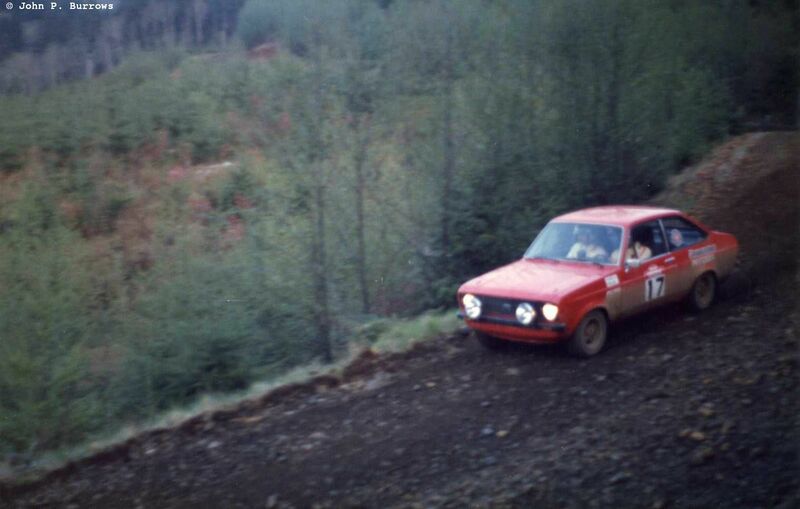 They lost a bit of time, as there were no spectators to help them back on the road. 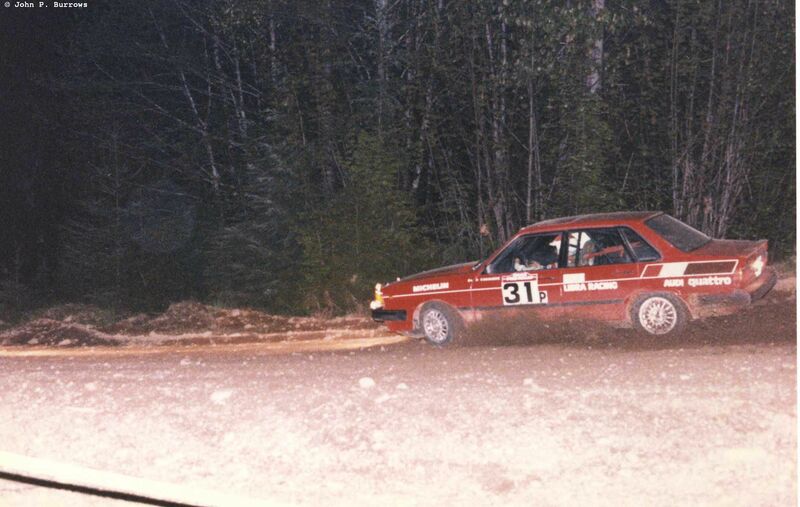 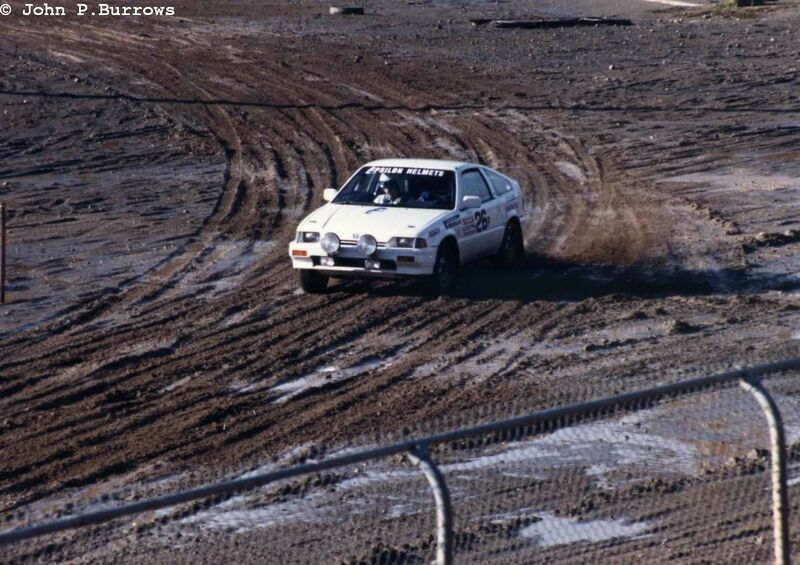 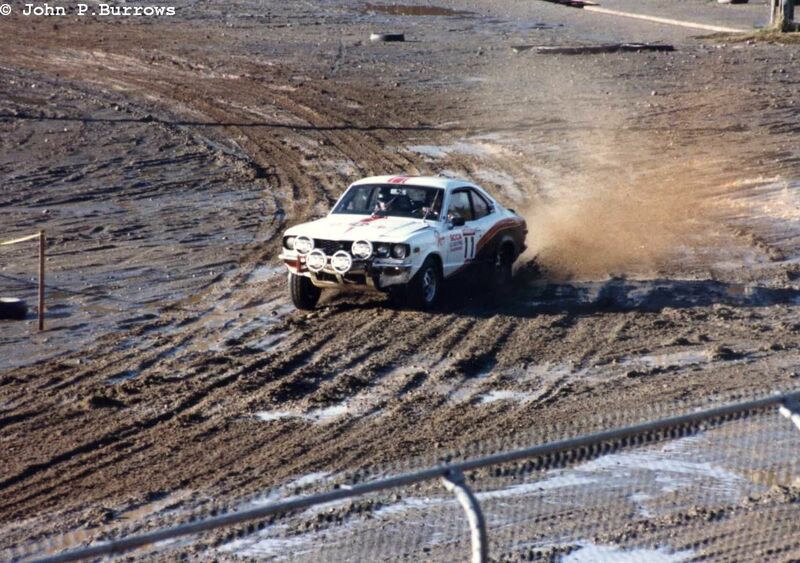 Gene Henderson was running what we called the “Grandfather of the Quattro”, an AMC Eagle SX/4. 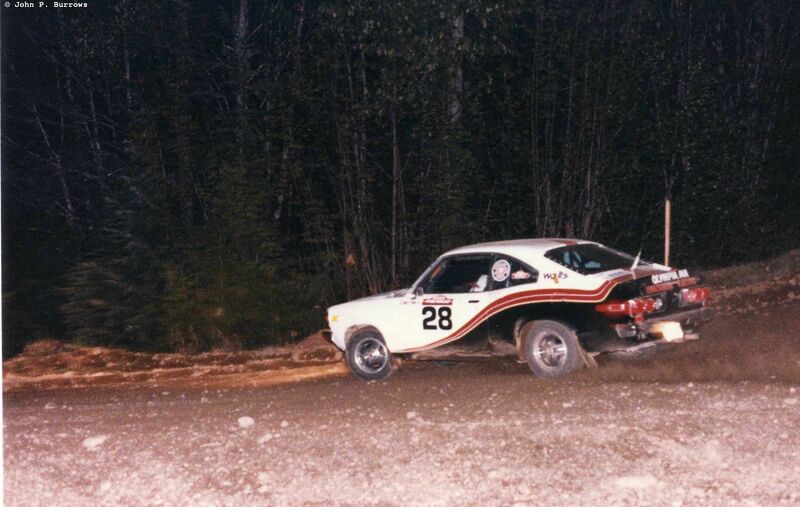 It was an AMC hatchback, the Sprit to which AMC joined with a full time four wheel drive system based on the Ferguson Formula system. 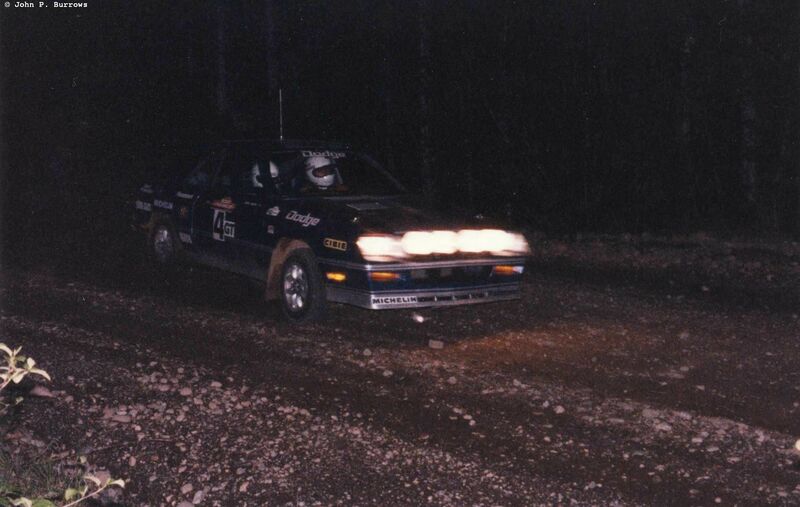 Guy Light’s Oldsmobile Omega. 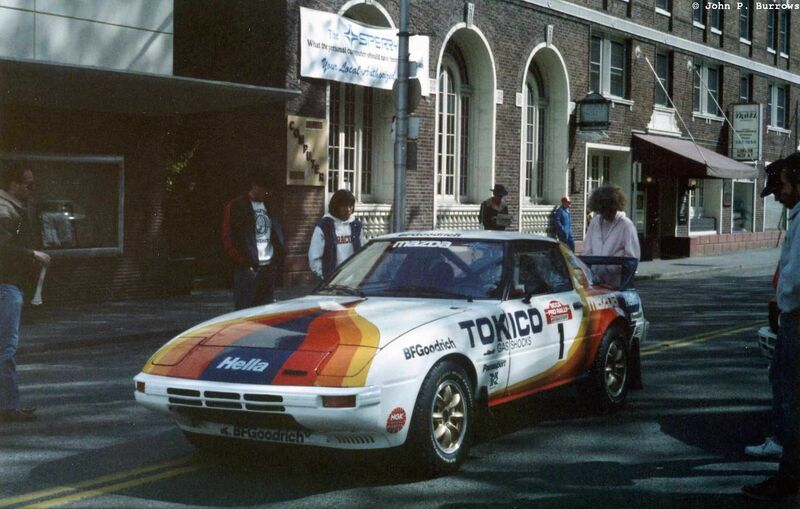 It was a favorite with its bellowing V-6 and automatic transmission. 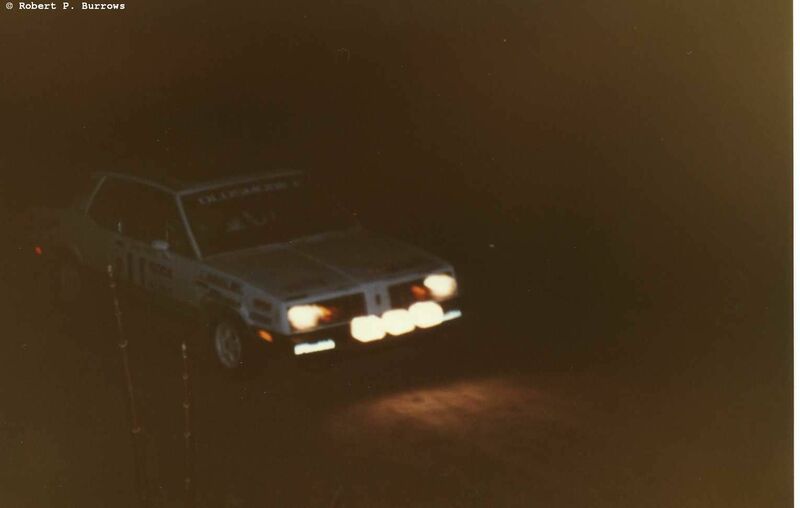 JB on a night stage. 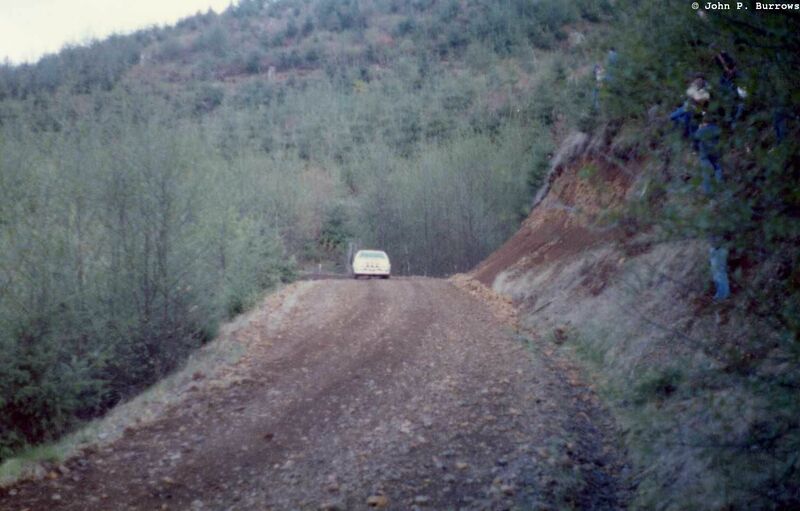 I seem to remember it being near Elma, WA. 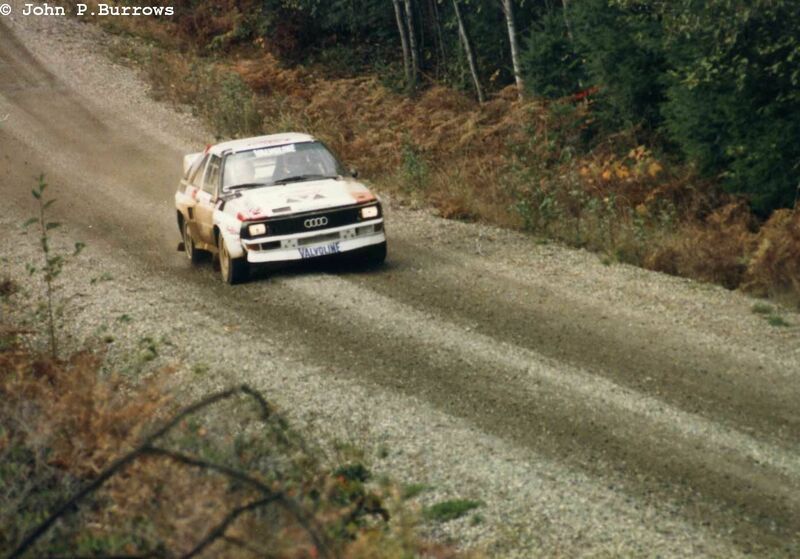 Buffum had a bit of a hard time getting the long wheelbase Quattro around the nearly 180 degree junction. 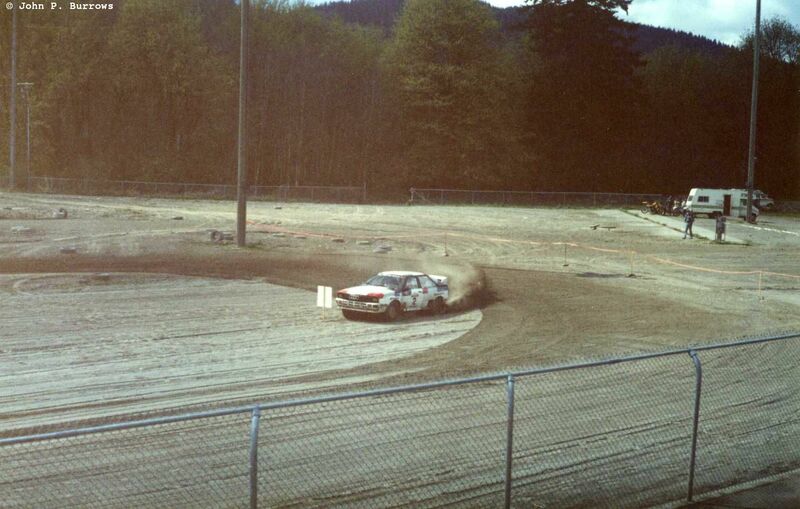 You can see a sizeable dent in the door from his earlier roll. 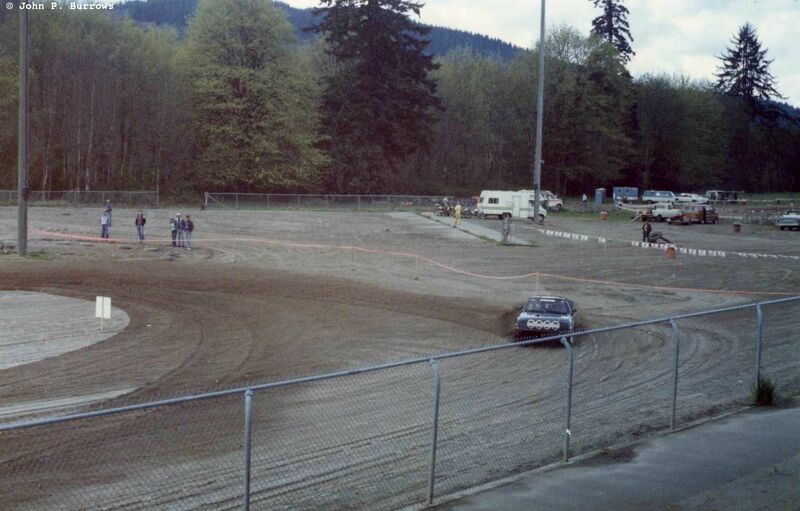 Guy Light almost missed the junction. 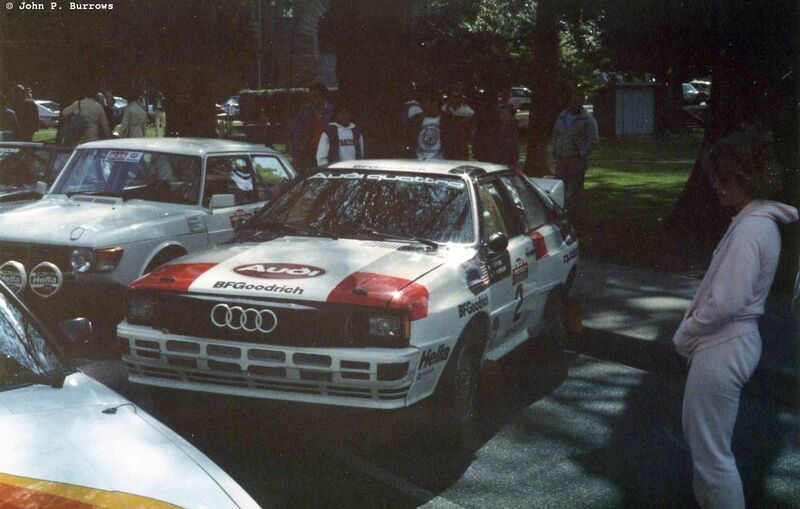 JB and the slightly dog eared Quattro. 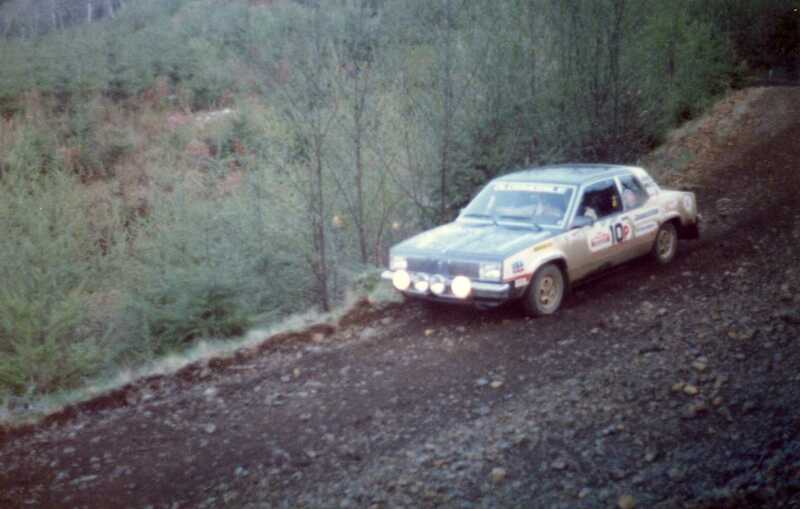 Buffum and Bill Brooks. 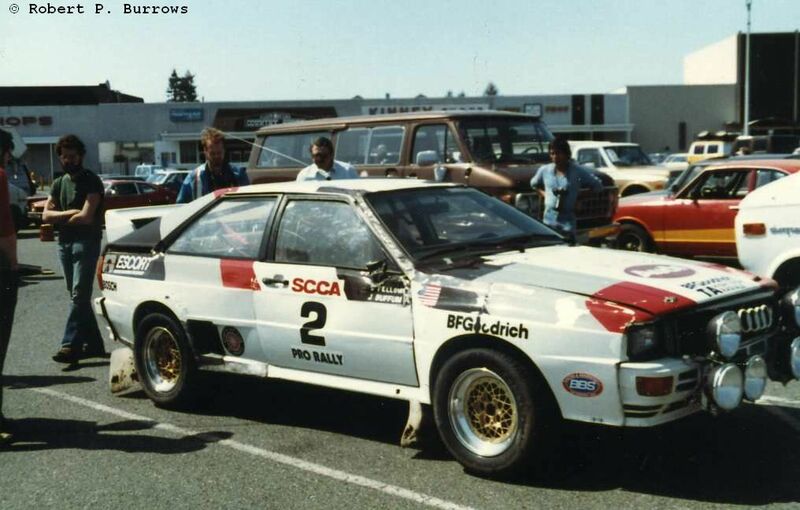 Brooks was a local Olympia driver running a FWD Audi Coupe that year. 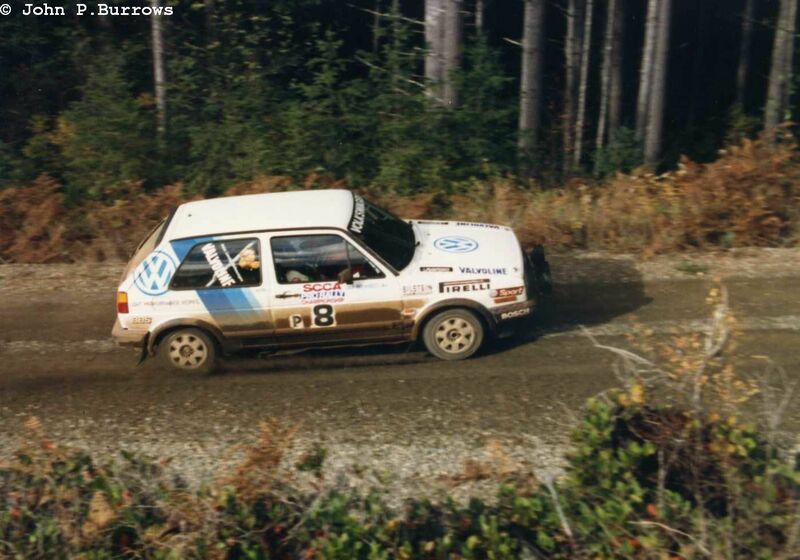 He later ran a Rabbit GTI sponsored by the local Olympia VW dealer. 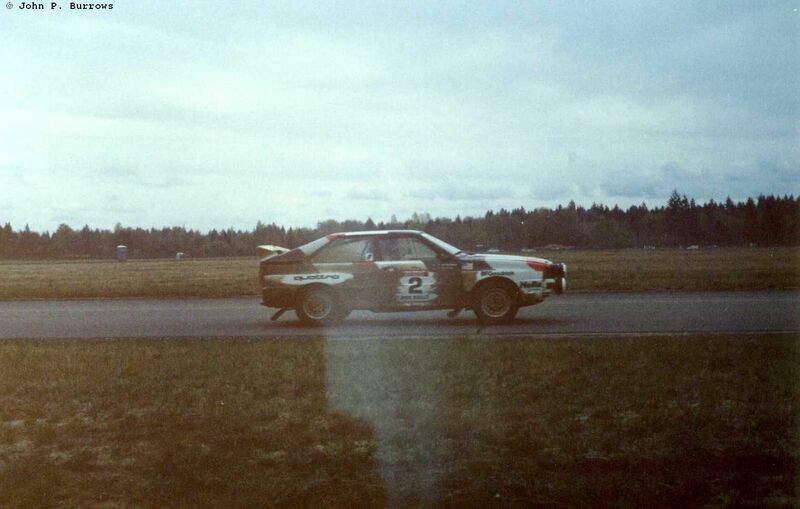 Sunday morning the second to the last stage was run on some roads near the Olympia airport. 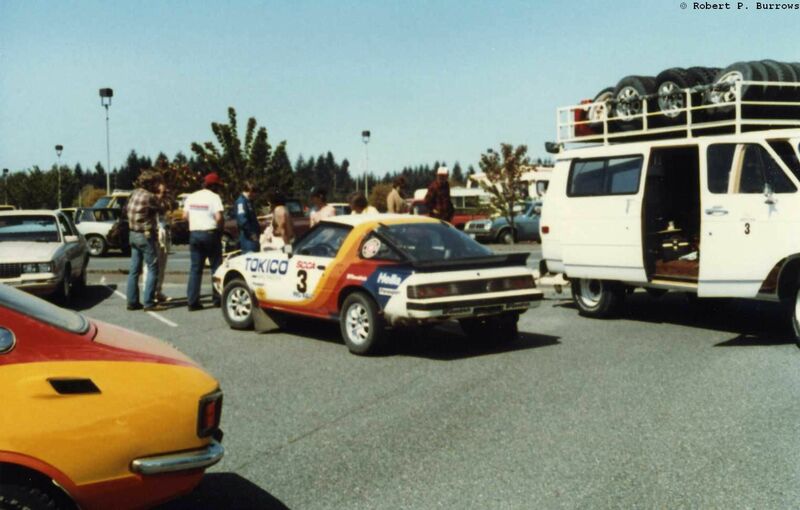 Prior to the last stage, the cars had a service and Parc Ferme at the South Sound Mall in Lacey, WA. 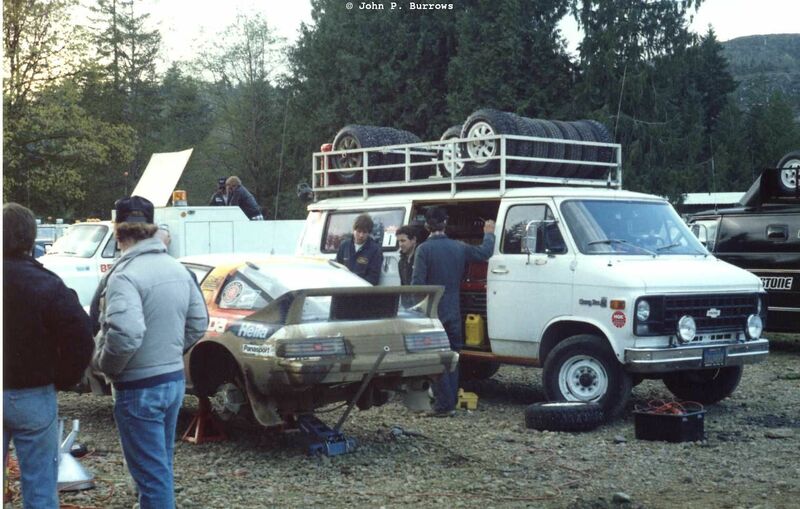 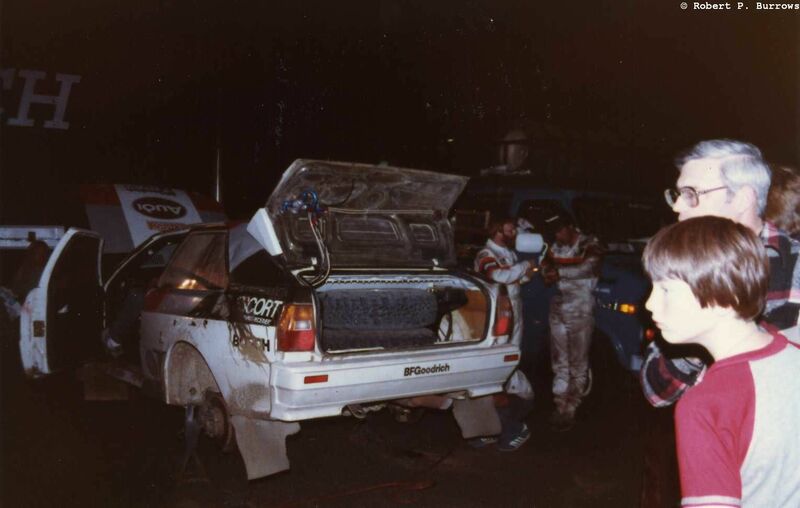 You can get a good look at Buffum’s battered Quattro. 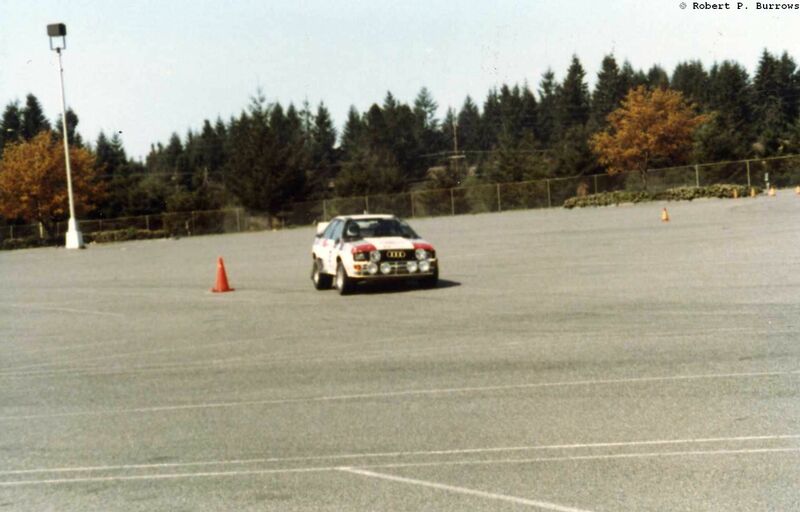 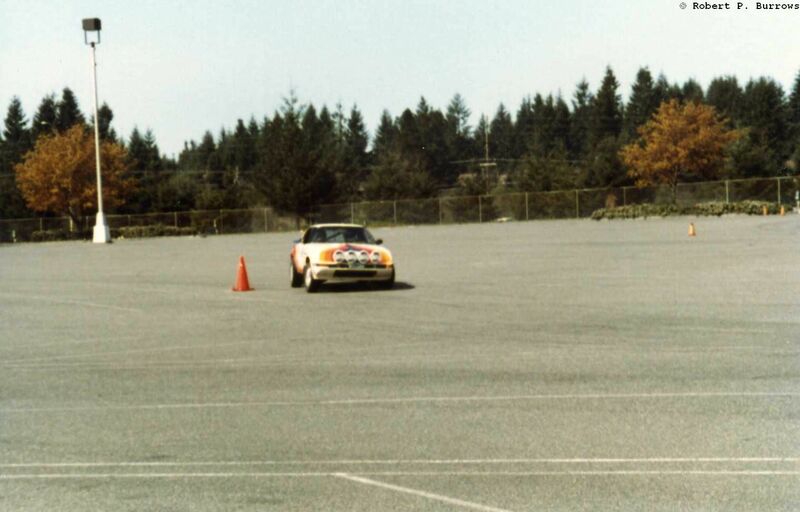 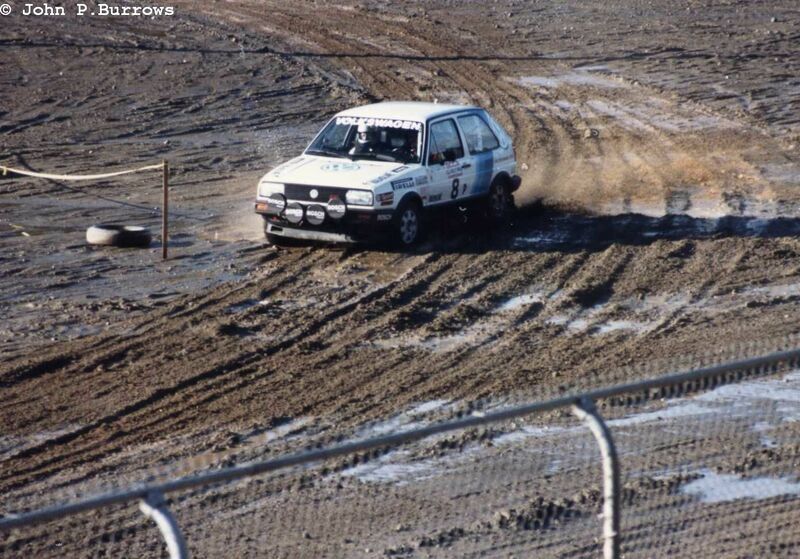 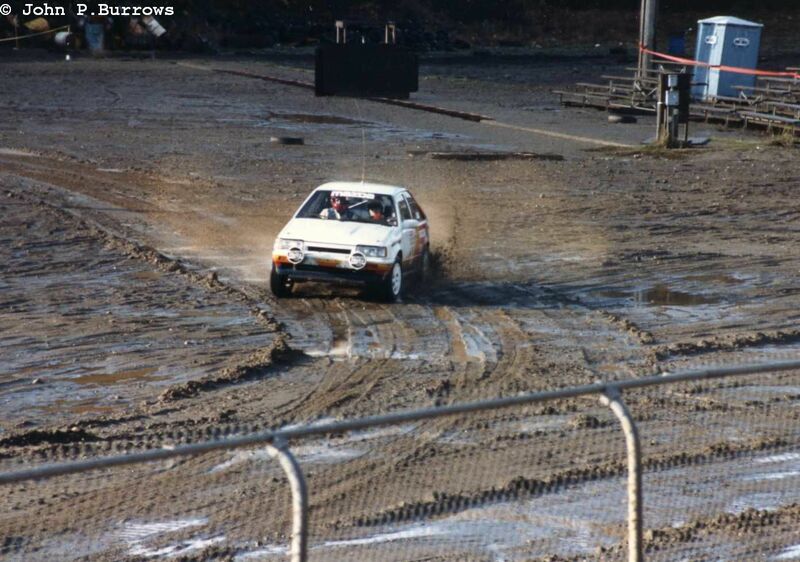 The last stage was an autocross run in the parking lot of the South Sound Mall. 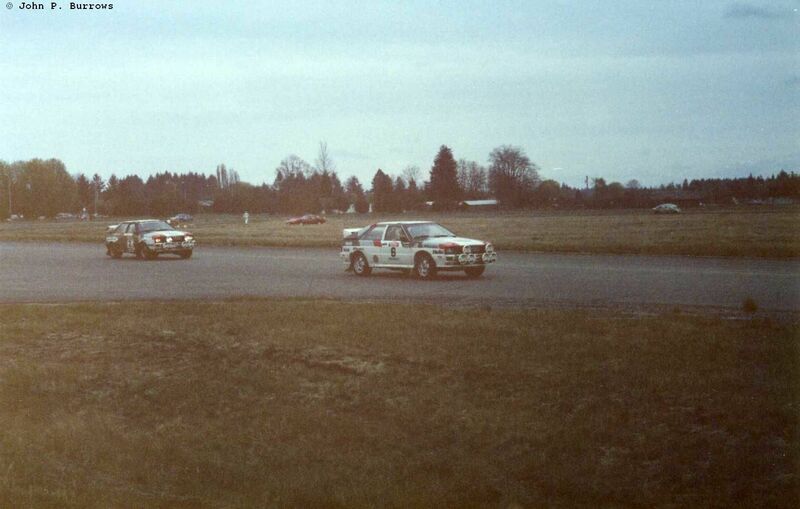 The cars were run in reverse order. 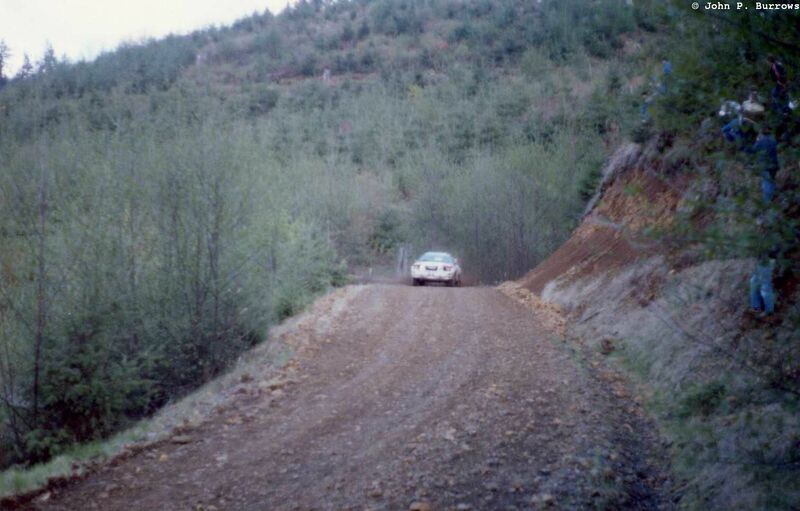 Millen, the winner of the rally, really hooned it, doing some great pre-Ken Block Gymkhana drifts and slides for the small crowd.